Over half the teenagers in a recent poll admitted seeing their parents check mobile devices while driving. In another survey of adults, 95% of the adults who admitted driving while distracted also admitted they do so in front of their children. These are disturbing statistics. As parents, we set a powerful example for our children. Our children watch and learn from our actions. 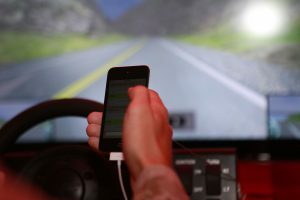 A recent CNN story titled Distracted While Driving: Parents do it, too discusses some of the statistics about adults driving while distracted in front of their children. The CNN article tells the story of a mother who caused a fatal collision when she picked up her phone to see a text. The story is difficult to read. It’s difficult to read about the death of another person. But, the article is difficult to read not just because of the death involved. It’s difficult to read because the mother who caused that death cares deeply about her children and community. It’s a tragic story of the deep and lasting effect upon the person at fault. The mother in the story did something she knew to be unsafe – reading a text while driving. Now, she suffers daily knowing the results of her lapse in judgment. I’ve included a section on my firm website discussing distracted driving. I’ve also written a number of blog posts on the topic. In recent blog posts I’ve discussed the first criminal case in Alabama against a distracted driver. Distracted driving is a deadly problem throughout the United States. Education and technology are both important in reducing the rate of distracted driving. Our public safety officials have worked hard to educate young drivers on this issue. However, education of our young drivers is much less effective if we don’t lead by example. It is difficult in a busy world to not be distracted while driving. Yet, we must work hard to practice safe habits that our children will see and absorb.